THE FILM PATROL: Why should you go to the International Film Series? Why should you go to the International Film Series? Actually, do, it’s very entertaining. Any question regarding the state and future of the cinema will trigger an intense and articulate stream of thoughts and observations that could lead us anywhere. In this way, he’s like the film series he’s been the director of for 17 years now. 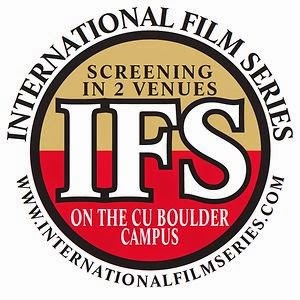 At the University of Colorado’s International Film Series, in action since 1941, dedicated attendance will teach you everything you need to know about the movies. “Juuuust a little rant. I just got back from Sundance, saw 30 films. Strong in the docs, as usual. Saw no 35-millimeter films and only one 16-millimeter. “I promised my brother we’d go see ‘American Sniper’ – I just wanted to see how many minutes of trailers there were. We guessed 3 to 4? 5 to 6? EIGHTEEN MINUTES of trailers! And before that there were tons of ads for TV shows. The multiplexes are whoring themselves out for commercials that tell people that they should stay home and watch TV. All this before I got to my first question. See what I mean? This is the kind of person you want programming films. This is the kind of person you love to have pie and coffee with after (OK, beer for Pablo), and argue movies with for hours. This guy and his ragtag crew are filled with evangelical light – they are on a mission to keep the art form, in all its permutations, alive. Film theorist Andre Bazin called for a kind of knowledge that would constitute a geology as well as a geography of cinema, providing depth as well as scope. This the International Film Series provides, as well as a thematic dimensions, and even nights based on technological parameters – for instance, its Thursday night 35mm revival series this spring. Good! We need roughage in our aesthetic diet. Given the extremely intelligent and film-savvy demographics of Boulder, the audience is up to the challenge. For instance – without IFS, I would never have gotten the chance to see “Infernal Affairs,” the Hong Kong film that Scorsese adapted into “The Departed.” Guess what? Even though “The Departed” won Best Picture, it is vastly inferior to the original. How would I ever have known otherwise? 1. LIVE INTERACTION. 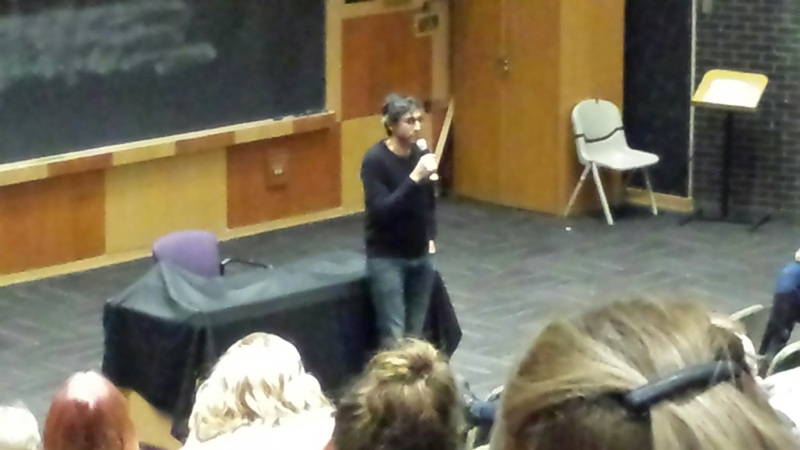 I was lucky enough to see director Ramin Bahrani (“Man Push Cart,” “Chop Shop”) in person at IFS earlier this week, showing a number of his short films, discussing his work, answering questions, and culminating with a screening of “Chop Shop.” FOR FREE. Director Ramin Bahrani takes questions at the International Film Series on Feb. 3 (yes I am the world's worst photographer). You see how this works? You can learn something, go deeper. 2. Tuesday night documentaries – “Citizenfour,” “The Hunting Ground,” and the aforementioned personal appearances. 4. Catching up on Oscar noms – special programs for completists will allow them to see all the live-action, animated, and documentary shorts. 5. Just good stuff – Godard’s new “Goodbye to Language” in 3D, the controversial Russian film “Leviathan,” Hal Hartley’s “Henry Fool” trilogy (yes, there is a trilogy!). We’re talking movies with some balls here. This is where movie exhibitors need to go, if they are to survive. Keep the blood pumping, don’t underestimate the crowd, throw them some curves. Use the performance space to make a more complete experience, go beyond just dimming the lights and showing stuff. A movie can be a launching point for the kind of thought and discussion that needs to happen in order to train a new generation of filmmakers and filmgoers. In other words, go. Go go go go go. Are you there yet?